Gabriel's Appliance Service. We service and repair appliances in the West Valley. This includes Goodyear, Avondale, Glendale, Tolleson, and Phoenix. We also sell any parts you need for your appliance right out of the store. Feel free to stop by during normal business hours to view our wide selection of parts. "I would recommend Gabriel's appliance to everyone. Jeff Gabriel is extremely nice and helpful. I called several appliance parts places and none were nearly as helpful or nice as he is. Prices are reasonable and is located in Avondale. Much closer then any other appliance parts in the west valley." Need fast, reliable appliance repair? Let us help. We are happy to provide appliance repair service to the entire West Valley. We offer dependable repairs to most appliances at affordable prices and we will be happy to answer any questions you may have about your appliance. We also provide knowlegable support for any of your appliance needs. Give us a call at (623) 535-9611, contact us on-line, or stop by our store in avondale and we will be happy to answer any of your questions. 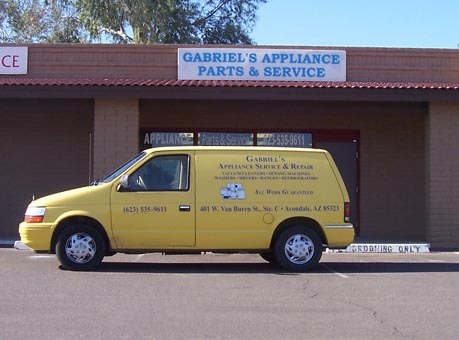 Gabriel's Appliance Service keeps a wide range of new factory parts on the truck, so your repairs are completed as quickly as possible. We can service almost any brand of home appliances. Plus, all of our work is guaranteed, so you dont have to settle for less.